Hello, I received my brand new C5400 router a few days ago. When I first hooked it up, everything seems to be working fine with stock firmware 160927. Then I upgraded the firmware to 170630 after a couple hours use. Suddenly the two 5GHz band wouldn't work. At the quick setup page, they were greyed out, and at the bottom of the web GUI, it says: the 5ghz network is unavailable due to restrictions in your region/country. I have tried to reset the router to factory default (several times), also tried to re-apply the firmware update again, neither helped. Also, even thought the MU MIMO option was not selected, under the Advanced/wireless setup section, it always shows "you must have devices support this feature ....". It seems somehow the router was permanently "written" during the firmware upgrade, and user can't apply certain settings. I believe there are still bugs to be worked out, especially with hardware version V2 and firmware verion 170630. Hopefully TP LINK will address this issue ASAP. Thanks. What country do you live in? Not all countries allow all bands. The router likely reads your country from your service provider.Yes, the MU-MIMO will only work with devices that also support that feature, which not everyone will realize, so they put that warning there to let them know, I guess! I am in the US and have that firmware on my C5400 V2 and it works fine (I use SmartConnect and have all three bands working, plus a guest network on the 2.4 band. 1. I'm in the US. My ISP is Comcast. 2. Just to be a little clearer regarding MU-MIMO: I certainly understand the devices need to support it for it to work. What I was trying to say is even though this feature was not selected, the warming message stays on the page, which was not the case when I first got the router. 3. More importantly on the 5GHz unavailable issue: at some point when I was experimenting the setup, I played with some channel selections to see if that'll improve the coverage in the house. It seems somehow the router took that "experimental" setup (i.e. certain channel were not approved for use in the US) and made a permanent mark somewhere. Then I lost the control of the "Mode" and "Channel" selection field. Regardless what I try, I can no longer activate the 5GHz network. I believe this is a bug in the firmware. Can you downgrade the firmware version? Anyway, this is a serious issue, I think you can report to the tplink support. Okay, same here (Xfinity X1 triple-play package). Ah, I didn't notice that since I keep SmartConnect on, so don't get to see the individual band settings, so I haven't seen them since I originally set them up except for when I turned it off for a second to check on it for you the other day. 3. More importantly on the 5GHz unavailable issue: at some point when I was experimenting the setup, I played with some channel selections to see if that'll improve the coverage in the house. It seems somehow the router took that "experimental" setup (i.e. certain channel were not approved for use in the US) and made a permanent mark somewhere. Then I lost the control of the "Mode" and "Channel" selection field. Regardless what I try, I can no longer activate the 5GHz network.I believe this is a bug in the firmware. So, you can't change the channel now, either? Even after resetting to factory defaults? Weird! I would exchange the router for a new one and send an e-mail explaining what happened to TP-LINK so they know. 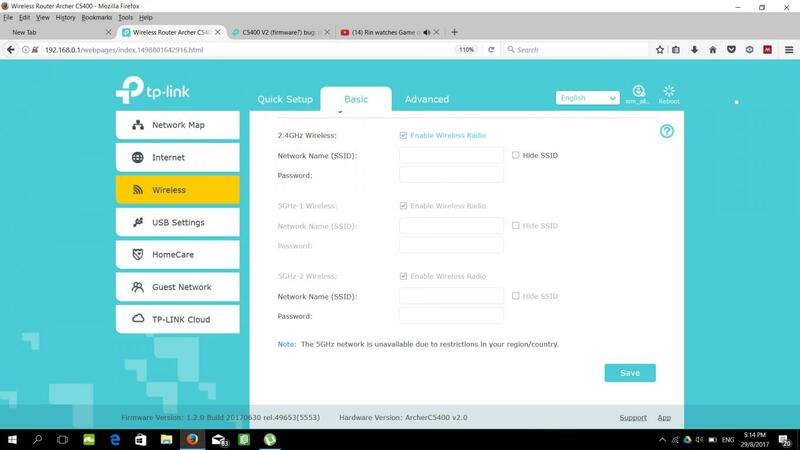 And when you get your new router, use an app on your phone or tablet that helps you to find the best channel for you to use by analyzing your network and the traffic of the channels around you from nearby networks. I actually just keep mine on auto on this router, which I don't usually do, but it has been working well. I am not using an extender or anything that would require it to be on the same channel. No you can't downgrade firmware. You can only upgrade. Don't tplink support check this forum for issues like this? Maybe I should post it at a major online retailer (Amazon, Walmart, newegg etc) so they can pay attention to this. hai.. i bought mine 2 month ago twice my ac5400 reset itself. Today is the second episode. During my setup one of the band was not available for malaysia (5G-1). It is possible the router auto reset it self and the 5G-1 not allowed in Malaysia. Already did. The support guy said it's a defective router asked me replace it. I do not think it's a hardware problem. I believe it's a firmware issue. My C5400 started to do the exact same thing after upgrading to 170630. I called and chatted into support and they wanted me to try a beta firmware but both were unable to send me a link until a "senior tech" was available on Monday. So I get to sit here for a weekend with a broken router that is less than a month old. Pretty frustrating TP-Link....pretty frustrating.